Everyone knows Bass Pro Shops. The giant, outdoor-focused retailer has locations all over the U.S., and sells clothing, gear for hunting, fishing, golfing, and other active adventures. 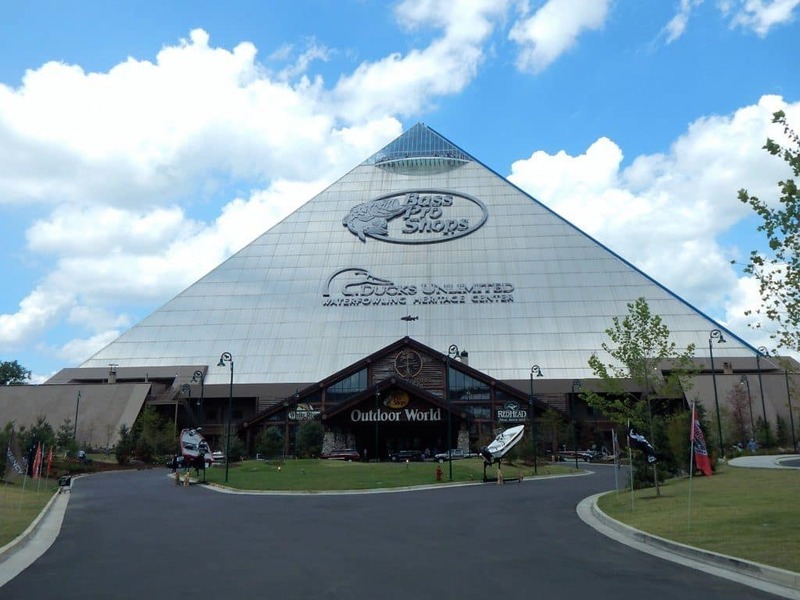 However, the Bass Pro Shops Pyramid location in Memphis is unlike any other store in the nation, and definitely worth a visit when you are in town. The Memphis Pyramid was built in 1991 on the banks of the Mississippi River as an arena for sports and concerts. Jointly owned by the city of Memphis and Shelby County, it was originally planned to house a shortwave radio station broadcasting Memphis music, a music museum, a Hard Rock Café and a theme park on Mud Island. Sadly, these plans never came to fruition. The Pyramid became the home of the University of Memphis men’s basketball team and then the Memphis Grizzlies. Mary J. Blige performed in 1997 and in 2002 it was the venue for the boxing match of the year – Lennox Lewis and Mike Tyson. In 2004, the Grizzlies moved to the FedExForum. Bob Seger and the Silver Bullet Band headlined the last concert in the building in 2007. The Pyramid sat empty for several years while the city of Memphis explored options for the building including a casino, indoor theme park and even a Mid-America branch of the Smithsonian Institute. Finally, in 2010, the city of Memphis worked a deal with Bass Pro Shops and The Pyramid became the retailer’s crown jewel. 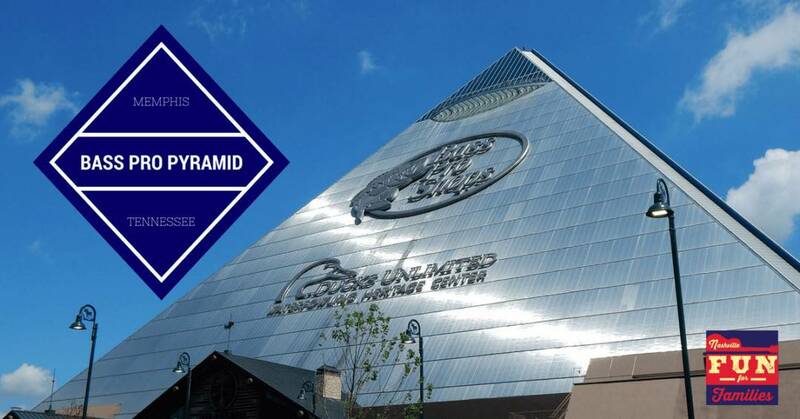 The Bass Pro Shops Pyramid opened to the public on April 29, 2015, and it should be on your list of must see attractions in Memphis. You can easily spend an afternoon exploring the store and all the different attractions inside. There are several aquariums throughout the store. You can see bass, alligator gar, catfish, and even alligators. The store has a marine biologist on staff and you can watch the daily fish feedings at 10 AM or 5 PM. Bring your bow and shoot some arrows in the store’s archery range. You can also practice pistol shooting with your gun and get some tips from the store staff in the 25-yard live fire range. Bring your own equipment, and it is $10 an hour to shoot. An annual pass is available to purchase for $100. There is also an arcade laser shooting gallery with targets and moving objects, great for both kids and adults. The machines are coin operated so be sure to have some quarters. Plan to have lunch or dinner at Uncle Buck’s while you visit. If there is a wait, you can get a pager and explore the store. The menu includes burgers, fish and chips as well as some original dishes. I had the salmon and grits and really enjoyed it! Check out the menu HERE. Uncle Buck’s also serves breakfast if you arrive early. See your choices HERE including the kids’ menu. 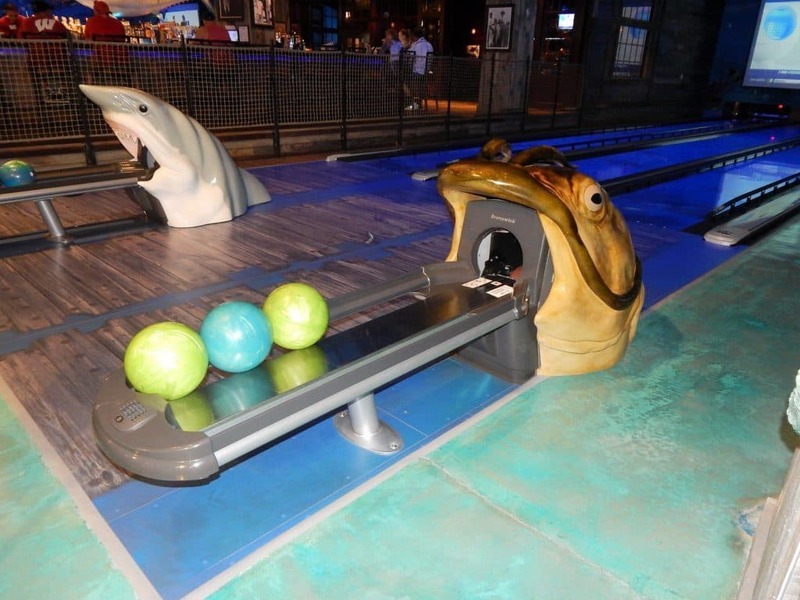 Spend an hour bowling under the sea! There are thirteen lanes that you can rent hourly. Even the ball returns look like sea creatures. Find the current prices HERE. 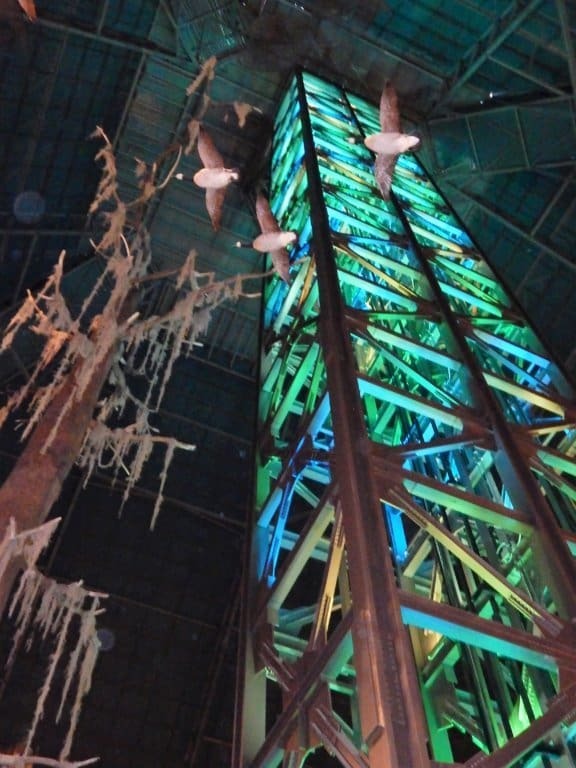 Your visit to the Bass Pro Shops Pyramid is not complete without a ride in the tallest free-standing elevator in the country. Located in the middle of the store, it will take you up 28 stories to The Lookout, the observation deck at the top of the Pyramid. You can dine (click for Menus) while enjoying views of the Mississippi River and downtown Memphis. Be sure to step outside onto the two glass-floored balconies. One provides spectacular views of the River and the bridge to Arkansas. The other looks out on downtown Memphis and St. Jude’s Children’s hospital. I am not one for heights, but the views are too enticing. I walked to the railing on top of the metal support posts, rather than the glass floor. There were kids there that were happily walking back and forth and enjoying the view. There is a fee for the elevator ($10/adults, $5/children before 4 PM). We found the view worth the price. If you stay at the Big Cypress Lodge, the fee is waived. Spend the night in the Pyramid in one of 103 rooms in the Big Cypress Lodge. The hotel has the feel of a traditional hunting lodge complete with fireplaces. When you visit Memphis, you can’t miss the Pyramid on the bank of the Mississippi River. Make sure you make some time to explore all the family fun that Bass Pro Shops has created within it. Find more fun in Memphis! Check out our visit to Beale Street and other places to visit on our Road Tripping page.